Disk Cleanup is a useful tool integrated in Windows that users may run to delete temporary files and old data to free up storage space. Microsoft revealed plans recently to deprecate the Disk Cleanup tool in favor of a similar feature integrated into the Settings app of the Windows 10 operating system. The company expanded Disk Cleanup in Windows 10 version 1809, the October 2018 Update. 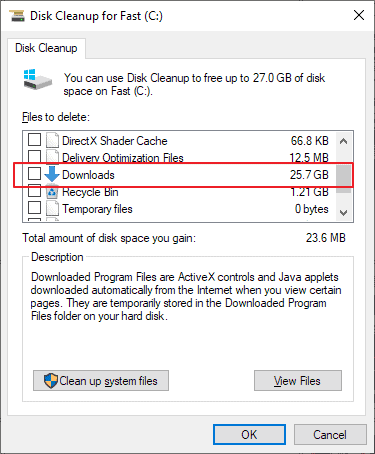 The core change adds an option to Disk Cleanup to delete all files in the Downloads folder of the user. Note: Microsoft stopped the rollout of the new feature update for Windows 10 days after its initial availability. Some users reported that the upgrade to the new version of Windows removed personal data from the user profile folder. Some Windows users and administrators like to run Disk Cleanup after successful feature update installations to remove traces of the previous version of Windows and free up Gigabytes of space in the process. Microsoft itself suggests to use the tool and other means to free up disk space on Windows 10 devices. The option to delete files in the Downloads folder has caught some users by surprise. Uses who check all Disk Cleanup options without going through them one by one discovered that the tool deleted the entire downloads folder on the system after it ran its course. The Downloads option is not checked in the Disk Cleanup tool or in the Settings application. Users need to check it actively to add cleanup of the Downloads folder to the process. Microsoft added options to delete the Downloads folder to the Settings app in previous Windows 10 versions but added the option to the Disk Cleanup tool in Windows 10 version 1809. In other words: if you run Windows 10 version 1809 or later, make sure you check only the options in the Settings app or Disk Cleanup that you require. Checking all options without verifying them will delete files in the Downloads folder on the system. Users who are affected by the deletion of files may use file recovery software like Recuva to get some or even all of the data restored. Now you: How big is your downloads folder? Microsoft added an option to delete the Downloads folder in the Disk Cleanup tool of Windows 10 version 1809, the October 2018 Update. 3.74GB. But it is on a different drive. Same with other documents. Windows 10 1809 couldn’t see any of those files to ‘lose’. I like to keep my boot drive lean and clean – makes Macrium Reflect images smaller. I do the same thing, it has the added benefit of making system partition backups super small (10 – 14GB~) so my bi-weekly backup task doesnt fill up my entire drive. Funny : Size of the Downloads folder : 2,10 GB (on another disk), Disk Cleanup proposes to delete… 66,8 MB. Zero (0) Kb. I am always making it a point to clean up directly after that I download something and then handle of implementing it, storing it then subsequently in the dynamic archive or static archive. This because already in 1978 I noticed that when your downloading things will quickly grow out of proportion and 40 years ago we even had not 3.74 GB, more something like 3.74 Mb. I never leave my documents in local drives, everything is in the cloud (onedrive, google drive, dropbox, etc). I have some strange behaviors: I read instruction manual before installing anything, I read the package insert of any remedy before taking it and I usually check what each option of a program does before blindly scoring them all. On a bright and sunny day, the cloud is going to go away. Personally, I can’t see putting something importANT on “the cloud”. Microsoft is not the only company that makes BIG mistakes. Play it safe. Backup your important files on removable media. “The Cloud” is just someone else’s computer prone to failure like every other PC. Just to explain better: I have a full backup of all my files either in a external drive too updated twice a week. In my local drive (240Gb SSD) I keep only Windows and Programs. Two more separate drivers (1Tb each) keeps my movies and music. uys, the pictures are confusing because while you have a red border drawn around “Downloads” you have “Downloaded Program Files” selected. The description is wrong. Just select “Downloads” in the picture and take the screenshot. You don’t need a border then, and then the description will match too. I only use the Download folder for simple downloading. I don’t think it’s a place to store things. Once it’s download I move it to another folder to where I think it will be better placed to keep things organized. Our shop has many customers that downloaded important pictures and documents to the downloads folder, and left them there. Some people use their computers the way they want to. I think Microsoft’s offering to blindly delete the contents of the downloads folder is foolish. I would like to see them remove that option from disk cleanup. Since they’ve never listened to me, a small partner, I expect they’ll just leave it as is. They should NEVER offer to delete any folders in the user account that could have personal files in it. I agree about MS overstepping ordinary user boundaries. Introducing such a default that offers the chance to accidentally purge possible temporary holding location is a disaster in the making. Especially after all these years of just going down the list of possible checkables with belief those checked won’t “harm” the internals created by user (not by MS), well what the hell do they expect people to instantly do a mental light yes/no digital transformation. Homie won’t play dat game. Yours is Yours but Mine in Mine. Currently, on my work machine, 22.6 gigs, and I’d be really mad if any of those files got deleted. Yep, that’s the risk. Fortunately, I only use Windows at work (because my employer requires it), so if there’s going to be data loss, it won’t be MY data! Mine’s on a different drive. My OS drive is a 256 GB SSD and I’m terrible about moving downloads, so I relocated the folder to keep the SSD from filling. Gotta wonder how many of those who clicked Downloads thought it was their browser download history or something. MS blew it on this one but they seem to blow it on most everything anymore. MS, google and facebook are running hard, neck and neck for last place letting customers and the law do their quality control. Peace and happiness in linux mint, here the control to erase it I have and I predict a sustained decline of users of windows 10 over time, if they continue on this path they will lose customers. Now my contribution already has a client less me! – do not store important files in drive C. If you don’t have other drives, create them. – the Download file is a transitory space for everything downloaded from Internet. Its content must be moved in another file on another drive than C.
– one can even replace the programs from Program Files with their portable version, in order to save space on C, in case that the C drive is small (I recommend at least 100GB). A shorter way of saying all of that is: don’t trust Windows with your data. Please don’t tell me you trust Linux with your data as well John ? 22.6 gigs. Is a lot of data that should be backed up from your IT Department. Maybe you should look into a JBOD or your RAID Enclosure for your 22.6 gigs. This is when I’m SOOOOO GLAD I’m on Windows 8. That is all! Seems like the upgrade did a more then good job cleaning up files. Maybe a little bit too good as it determined that even folders with lot’s of files in them were deemed not important and deleted. Why in the world would a upgrade of the same OS do any thing of the sort in performing a simple in place upgrade? Maybe because the upgrades have never respected many of the changes user make in where file are stored or new folders. Everything reverts to defaults in many cases when upgrading. As we tick up in more severe issues with these upgrades and more users are affected. Microsoft will begin to see users abandon Windows in noticeable numbers.